Tapered Bushing Sprockets (TL) Bushing-Bore Sprockets for ANSI Roller Chain. Change bore size without replacing your sprocket.Easy to install, Taper-Bushed Sprockets give you the flexibility to use the same sprocket with different shaft diameters. Purchase Taper-Bushings(Sold separately) to match the bore sizes you need. Use with ANSI single and double-strand chain. 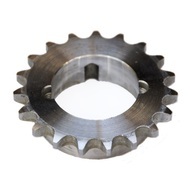 These steel sprockets and bushings meet all ANSI requirements.